9135 E. Howard - dial only. Note that this is not an original, period Howard dial but is a modern replica of one from a marble front wall clock. Made from some composite material and fairly heavy, it is very well done and hard to tell that it is not the real thing. There are no drilled winding holes so you can add a quartz movement or anything else if you wish. It will make a great looking clock for very little money. All the numerals and lettering are recessed so it not only has the look of real marble but has the feel also. The condition is perfect without any losses or damages. 21 inches tall. 11 ¾ inch diameter of the outer chapter ring so a 6 inch minute hand would be perfect. $80. 9136 Original “Wonder Alarm” alarm clock box. This is a cute little item in great, original condition. It is a wooden packing box for an alarm clock sold by “Wm. H. Terhune & Co. 25 Murray Street, New York” as indicated by the label on this box. The condition is perfect, without any breaks or loose joints. 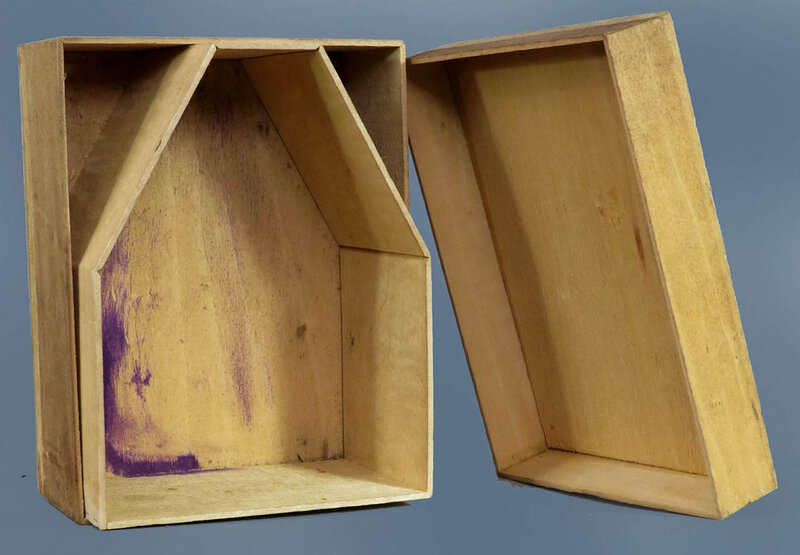 The interior box is rather interesting in construction because it is made from one piece of thin wood, bent at the corners so it only has one joint and that is dovetailed. This would make an interesting gift and it would be fun to search for a vintage alarm clock to fit it. From the shape, I would think it would be a bell on top model. 8075 Rare Original 1871 jewelers’ circular catalog. This is not a reprint as so many of them are but rather it is an original 1871 circular that was sent to various jewelry stores. The jewelry store could then look at various manufacturers and the products they offered to order for their inventory. The condition is quite good with no missing or dogeared pages and very little discoloration. There are a total of 40 pages counting the covers. 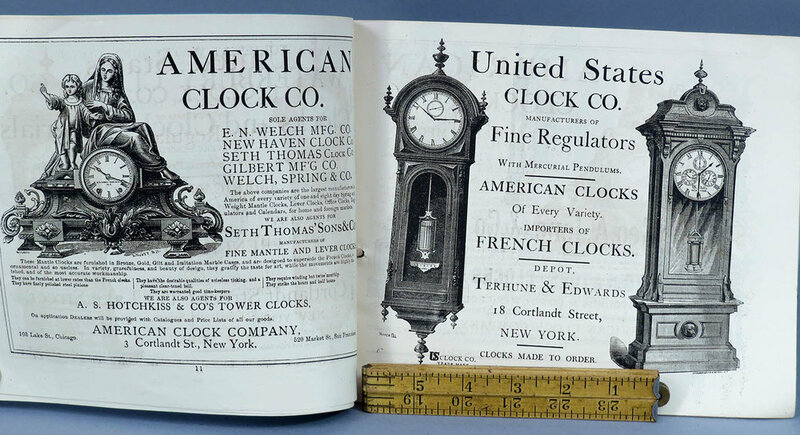 There are five pages of clock advertising from the companies of Waterbury, American Clock Company, United States Clock Company, Kroeber and George Jones & Co. This would make a rather unique gift for someone. 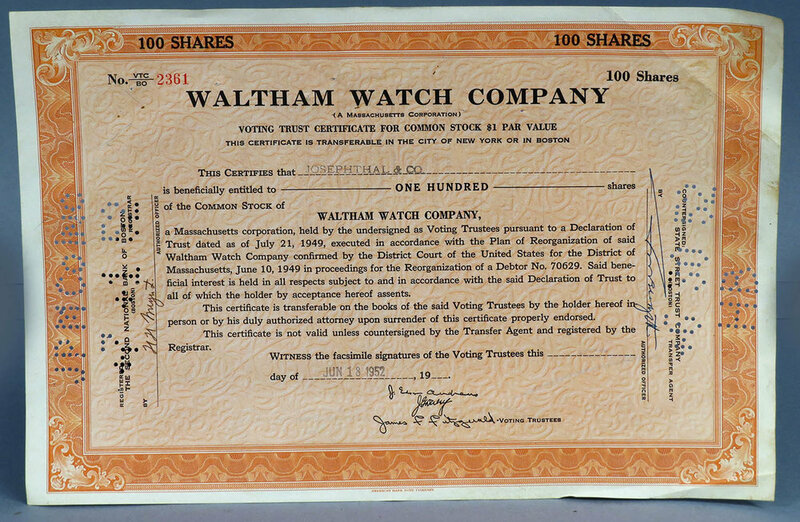 8076 Two original Waltham Watch Company stock certificates. Two original Waltham Watch Company stock certificates. These are original stock certificates not reprints or photocopies. They are both very crisp and the color is bright without any tears or damages. They were issued to Josephthal & Co. on June 18, 1952 and consist of 100 shares each. They would make an interesting item framed on your wall or perhaps as a gift. Each one measures 8" x 12". $25.